Receiving and giving gifts feels good. What doesn't feel so great is shopping during the last week before Christmas. Parking lots are full. People are distracted so their driving is dangerously erratic. A good alternative to shopping in this competitive environment is to stay home, have a cup of coffee, listen to a podcast and make gifts in your kitchen. I have two favorite recipes I want to share that are easy-to-make gifts guaranteed to bring pleasure to your friends and loved ones: hot fudge sauce and Moroccan preserved lemons. 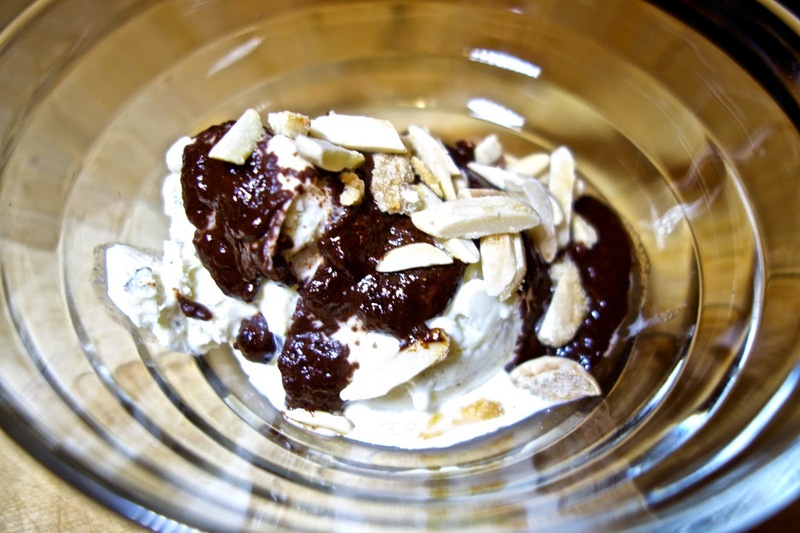 Hot fudge sauce for hot fudge sundaes is a most delicious treat with delicious contrasts of warm rich chocolate, icy cold vanilla ice cream and crunchy almond slivers. 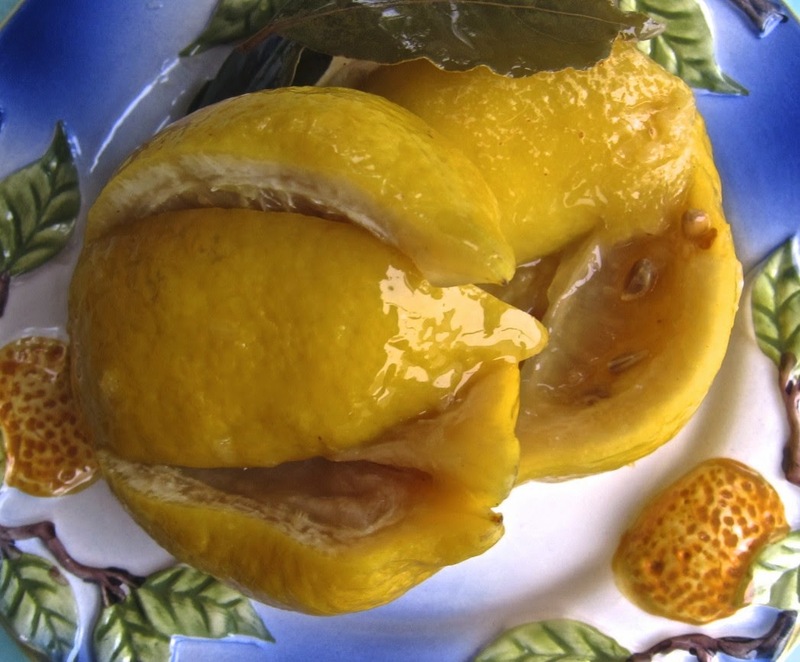 Moroccan preserved lemons are used to make tagines, the wonderful meat and vegetable dishes that are served in conical dishes. Tagines seem exotic but at their heart they are braises. What gives them their unique flavor is the addition of preserved lemons. During a cooking class on a press trip in Morocco, we were shown how to make vegetable pickles, tagines and preserved lemons. Ready to eat within two weeks, the longer they are kept in the jar, the more flavorful they become. Both recipes are simple and easy to prepare, using no additives or preservatives and filled with the wonderful flavor of natural ingredients. Read the labels of store-bought hot fudge and there will be ingredients you did not want to put on your sundae. The beauty of this recipe is it's simplicity. Cream and good quality chocolate are all you need. Four ounce canning jars are good for gift-giving. Buy canning jars (Ball and Kerr) because they will not break when placed in a warm water bath to reheat the hot fudge. 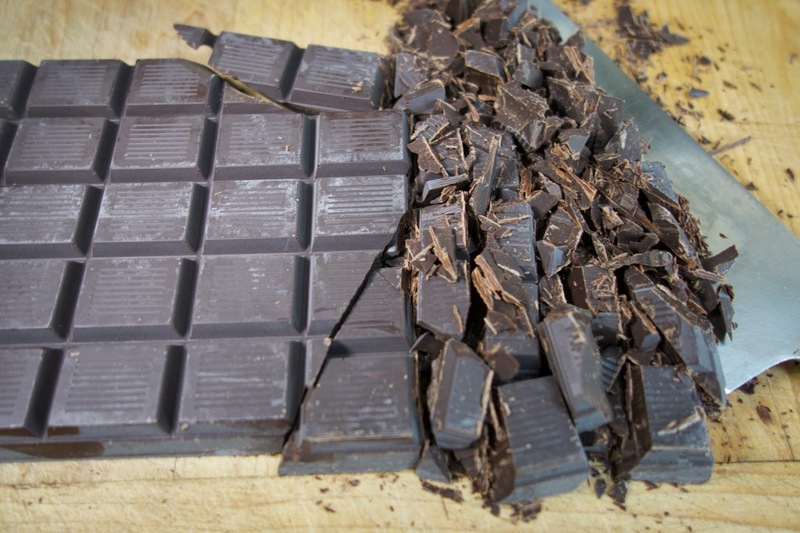 Use good quality chocolate with no preservatives. I like to use Belgium chocolate with 70% cacao. The quality of the cream is no less important. The only heavy cream without preservatives I have found is sold at Trader Joe's. Place the canning jars in a large pot. Fill with water to cover the jars. Place on a burner and bring the water to a boil. Keep the water boiling for 10 minutes. Turn off the heat. Drop the canning lids into the hot water. Set aside. In a heavy-bottom saucepan, heat the cream until simmering. Remove from the flame. 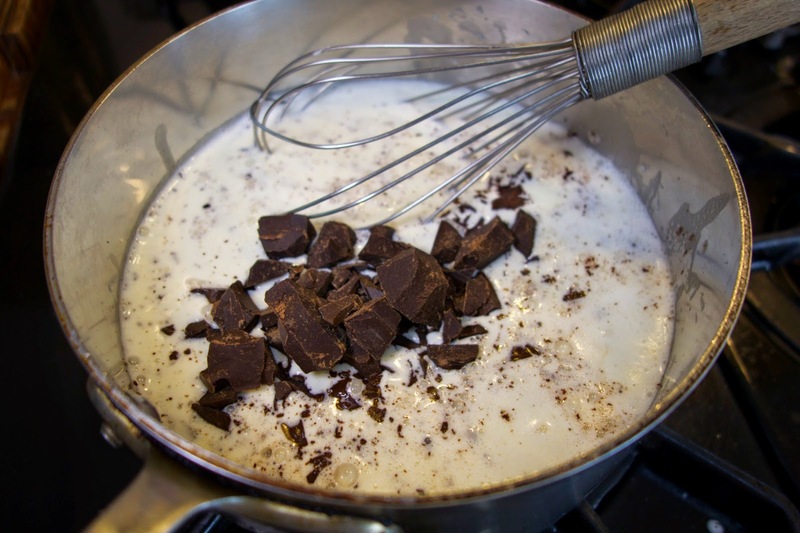 Use a large wire whisk to mix the chocolate into the warm cream. 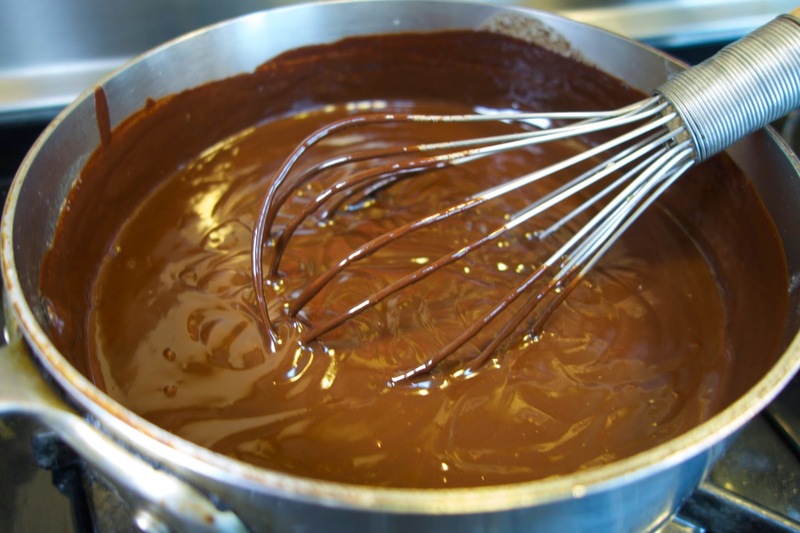 Stir well until the chocolate is incorporated into the cream. 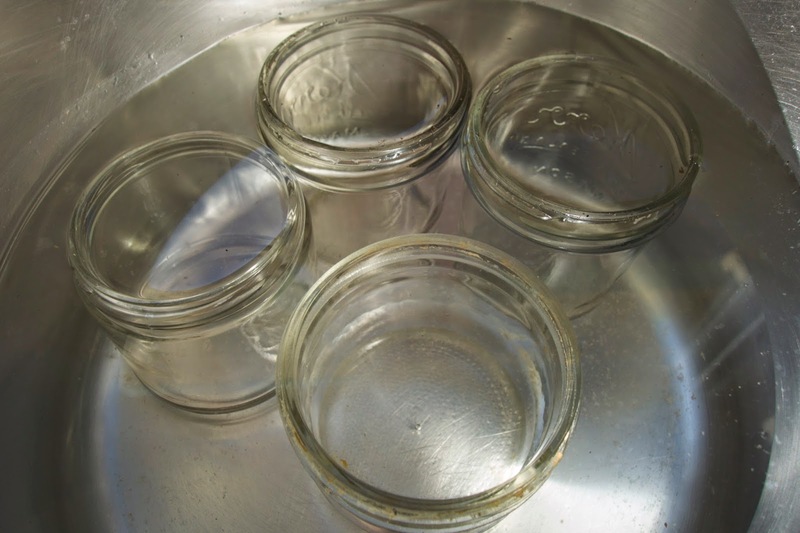 Remove the sterilized jars and lids from the water. Dry well. Fill each jar within 1/4" of the top. Seal with a lid. Before serving, place a small saucepan on the stove on medium heat. Remove the lid and place the jar of hot fudge in the water. Simmer ten minutes or until the chocolate has heated. Drizzle onto scoops of ice cream. Top with caramelized nuts (see below recipe) and whipped cream (optional). Trader Joe's got me hooked on their blanched almond slivers. They are inexpensive and easy to use. The nuts can be used raw or lightly toasted. Caramelized, they are the perfect topping for a hot fudge sundae. 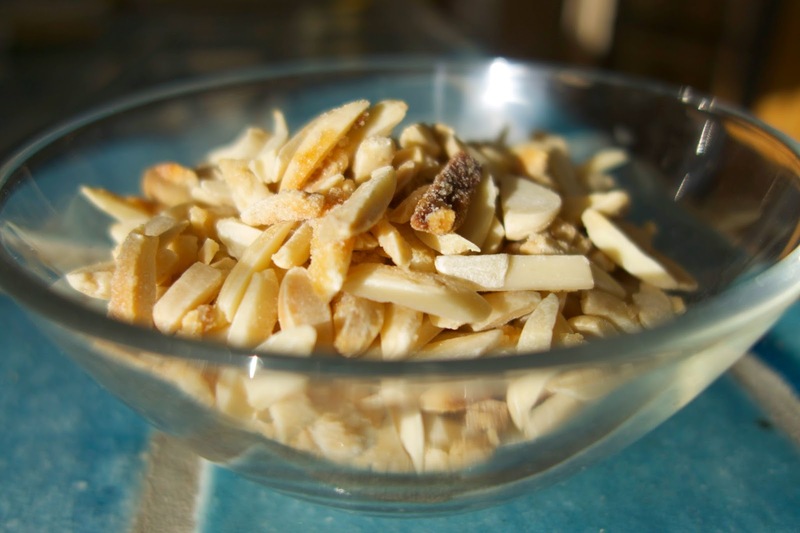 When I caramelize almonds, I make a lot because they are delicious as a sweet snack or used in cakes, cookies and muffins. Place a large frying pan on a low flame. When warm, add the slivers and toss to lightly brown. Add the raw sugar. Mix well with the almonds. Use a non-stick silicone spatula to toss the sugar together with the almonds. Continue tossing together until the sugar begins to melt. Be careful the sugar doesn't burn. Remove from the flame and allow to cool. Do not allow the slivers to form clumps. The lemons will keep for many months in the refrigerator. The longer they cure, the more fragrant their flavor. Mixed into a sauce, they have a unique citrus-perfume. 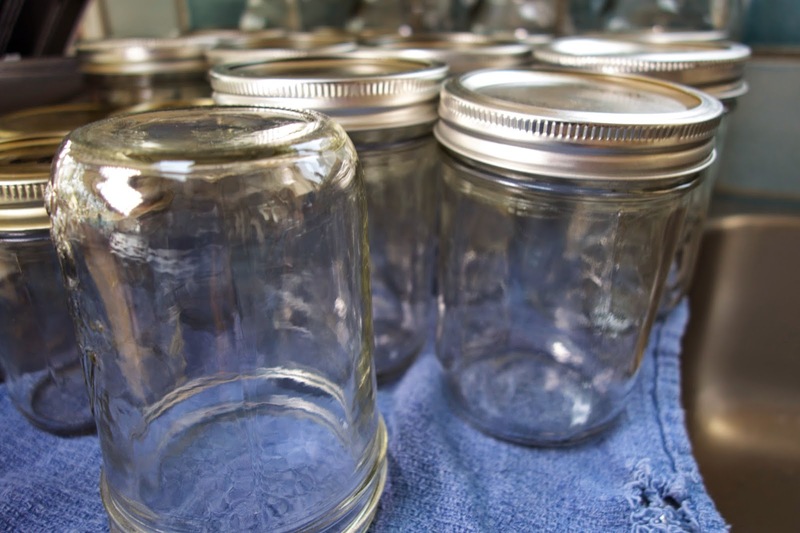 Place the canning jars into a large pot. Fill with water so the jars are submerged. Place on a burner and bring the water to a boil for ten minutes to sterilize. Remove from the burner, drop in the lids and set aside. Rinse and scrub well the lemons. Dry and set aside. Remove the jars and lids from the water. Dry. Set up the dry spices and jars on a counter so you can work assembly style. Into each jar, place 3 bay leaves, a 1/4 teaspoon of whole black peppercorns and a pinch of hot pepper flakes. 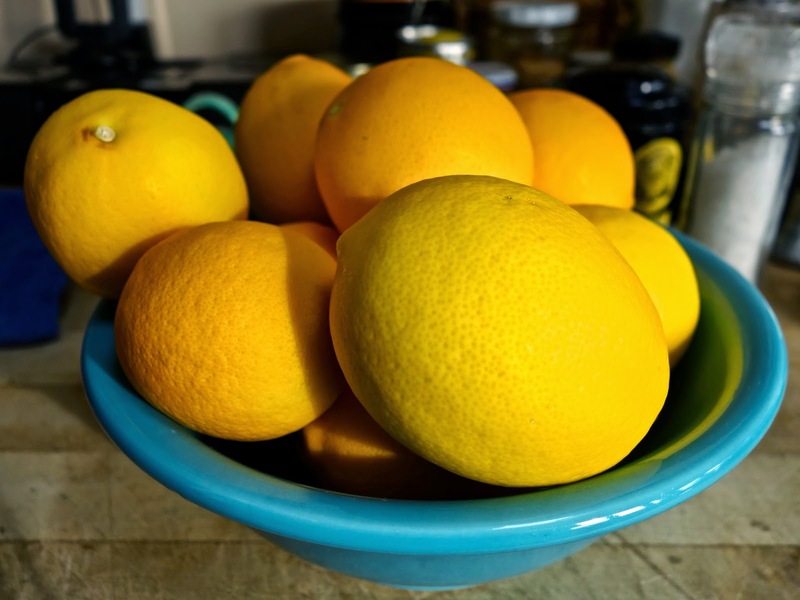 Pick out 18 of the nicest formed lemons, with smooth skin and set aside. Juice the remaining lemons as each jar is filled. All the remaining lemons may not be needed, depending on how juicy they are. Each of the whole lemons to be preserved will be cut into quarters but kept whole by cutting 2/3s of the way down the lemon. Rotate the lemon and make a similar cut so there are 4 sections of lemon still attached on the bottom. Each jar will have three lemons. Place the first lemon cut side up in the jar. Spread the lemon open and sprinkle in 1 tablespoon of kosher salt. Press down to release juice. Do the same with the next two lemons. Pour in lemon juice so the lemons are covered, just below the lip of the jar. Seal with the lid and place in the refrigerator. 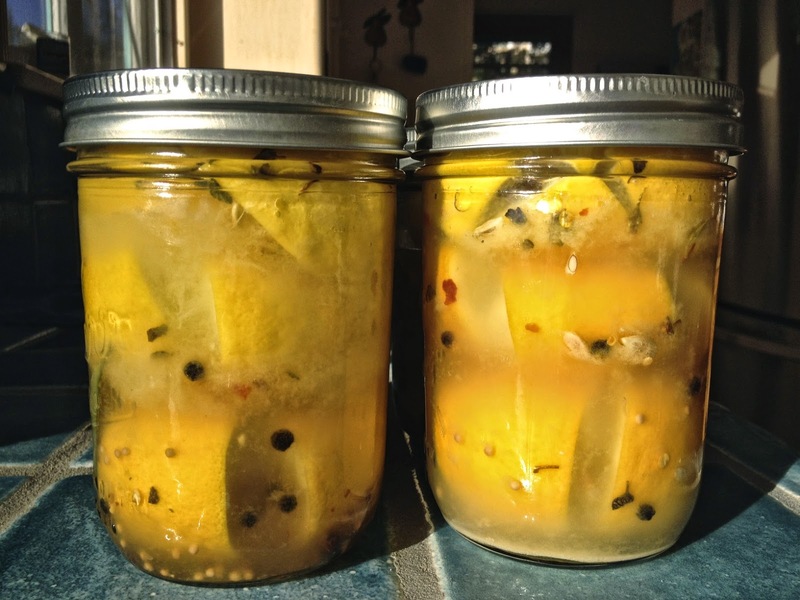 Once a week, check the jars to see if more lemon juice should be added to keep the lemons covered. Periodically shake the jars for even distribution of the spices. On our press trip we traveled around Morocco from Casablanca on the coast to Fez in the east and then into the center of the country with stops in Marrakech and the High Atlas Mountains where we had our cooking lessons. The tagine is a basic dish with an infinite number of variations which depend on the seasons, the region and the personal taste of the cook. If you do not have a clay tagine, a Chinese clay pot or a heavy bottom large sauce pan will work almost as well. Cut the chicken into wings, legs, thighs and breasts. Place the chicken pieces into a container. Cover with water. Add kosher salt. Cover and refrigerate overnight. Put the bones into a pot, cover with water and simmer 60 minutes. Strain and discard the bones. Refrigerate the stock to use in the tagine. Remove the chicken from the brine. Wash and pat dry. Skim off any fat from the stock. Bend the cilantro in half to better control and finely cut. Place the garlic and cilantro pieces into a mortar and pestle or on a cutting board and mash together. Place the chicken pieces in a tagine or in a pot with a cover. Add the garlic-cilantro paste, oils, spices and toss well to coat. Place on a medium flame. Cover. Use tongs to turn frequently to brown. Add chicken stock and stir well to create the sauce. Add carrots, celery, chopped raw onions, finely chopped preserved lemon peel and cracked green olives. Simmer 15 minutes. Taste and adjust seasoning with sea salt or ground pepper. Continue cooking until the chicken pieces are tender, place the covered tagine on the table and serve with steamed rice as a side dish. 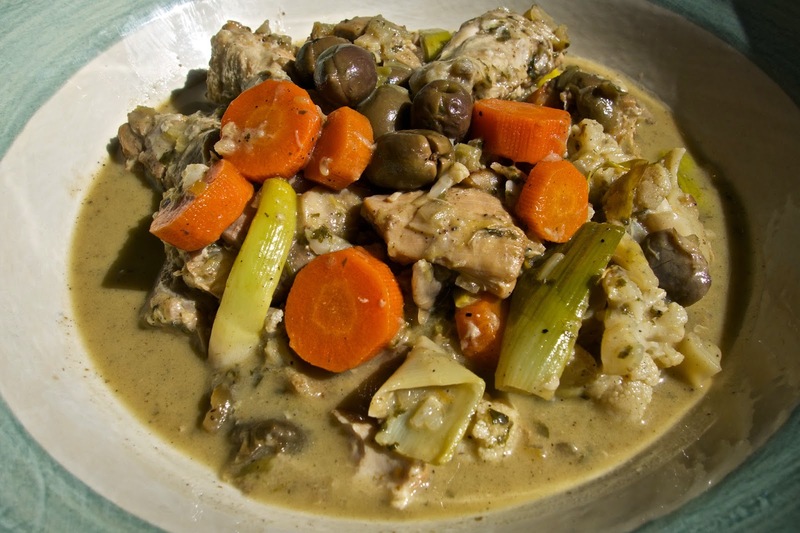 If a tagine is not available, transfer the chicken and sauce to a covered casserole dish.